When it comes to the Bride's outfit, the dress is the real show-stopper, but something else that is absolutely essential to the overall look is the wedding shoes. Finding the perfect shoes is important, you want to get the perfect color, design, height, and comfort, but one thing you don't want is a crazy expensive price tag! Check out some of the prettiest shoes we could find, and compare them to the more budget friendly versions! A recent trend we have started to see a lot of is the combination of silver and gold to a champagne look. This Jimmy Choo 'Crown' Pump has a glittering fabric in a champagne color with a five inch heel and a one inch platform on the front and a peep toe. It's a gorgeous shoe but with the $695 price tag, this one is definitely a splurge. For a similar style check out this Enzo Angiolini 'Merryann' Pump for just $79.95! 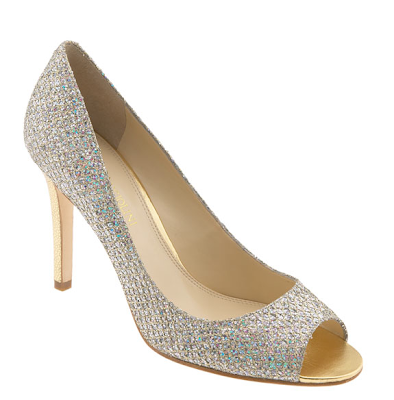 The heel on this shoe is just under 4", and the fabric is a sparkling gold and silver metallic. If you were planning on going with a more traditional look, many brides consider a plain white to be the classic bridal shoe color. By not including embellishments and crystals, the shoes allow the dress to shine as it should, but give you a complete look too! At $795, these Christian Louboutin's are certainly considered a 'Spend'. With a five inch heel and one inch platform, a Bride wearing these heels is going to get a sudden burst of height. Although wildly expensive, these shoes are a classic look and even have your something blue taken care of, check out the insole! If you love the idea of a classic white heel, but aren't prepared to drop nearly eight hundred dollars on a pair of shoes, fear not. This Nine West 'Sharina' White Slingback Pump has a 3.5 inch heel with a .75 inch platform. The shoe shares a similar style with the Louboutin's with a peep toe in the front and a small exposure in the back, and at $53.99, the savings are incredible. If your a bride that was looking for something exciting to pop underneath your dress, you may want to consider using a bright color instead of the more traditional palette. 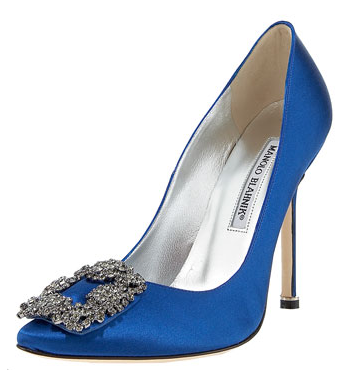 These $945, bright blue Manolo Blahnik Jeweled Satin Pumps have a 4.5 inch heel with a crystal encrusted broach at the toe. The price is expensive, but we have the admit, the impact is powerful! To get that same powerful effect, consider these Nina 'Elke LS' heels with a four inch heel and rhinestone embellished bow for just $99.95. These shoes don't only come in this True Blue Luster satin, there also bright pink, ivory, white, and more! For our brides who wait until the last minute to pick out the shoes for their big day, don't feel pressured to rush into any decisions and blow your budget due to stress! Browse a couple of stores for the style that suits the overall look of your wedding, and make an educated decision. No matter what remember to get something that fits perfectly so you are comfortable all night long!